L.A. is an amazing place, and we have lots of reasons to be thankful for living here. We also have a responsibility to take care of our city—its people, animals, trees, beaches and more. 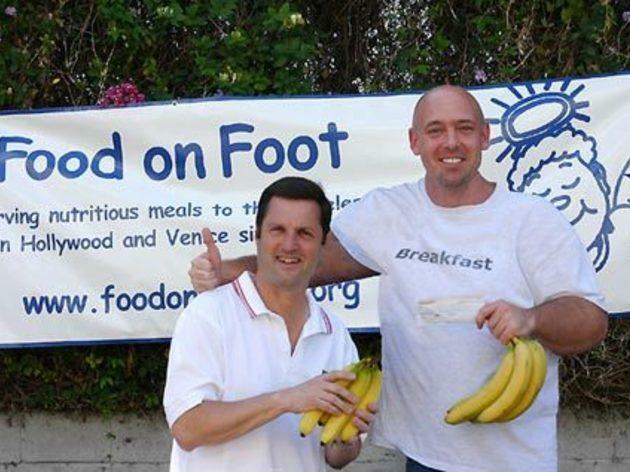 If you’re looking for ways to give back, volunteer opportunities in Los Angeles abound. Start your charity work by choosing from our list of some of the best places to volunteer, from Santa Monica to Downtown Los Angles and even in the SGV. Downtown’s Midnight Mission is one of the best-run organizations of its kind, offering counseling, education, training and job placement to the city’s homeless population, as well as food, shelter, personal hygiene and medical care. 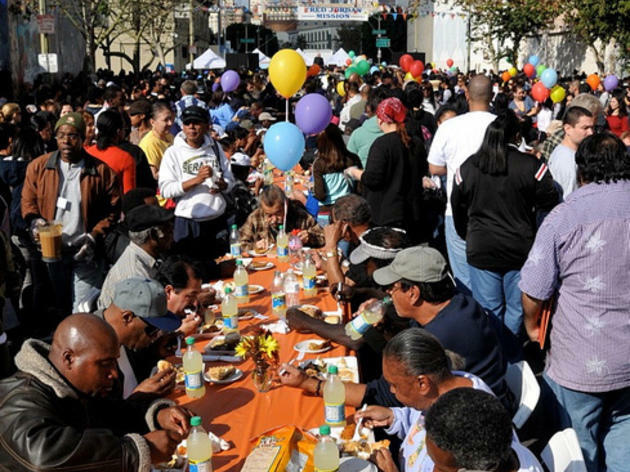 Along with regular meal services and food donation drives, the Mission holds special Thanksgiving and Christmas events. If you’d like to help during a special event, start with some regular volunteer hours—the Mission’s website has a form you can fill out to help match you with the right service. Note: Because it’s an all-male facility, Midnight Mission asks that female volunteers come with a companion (male or female). 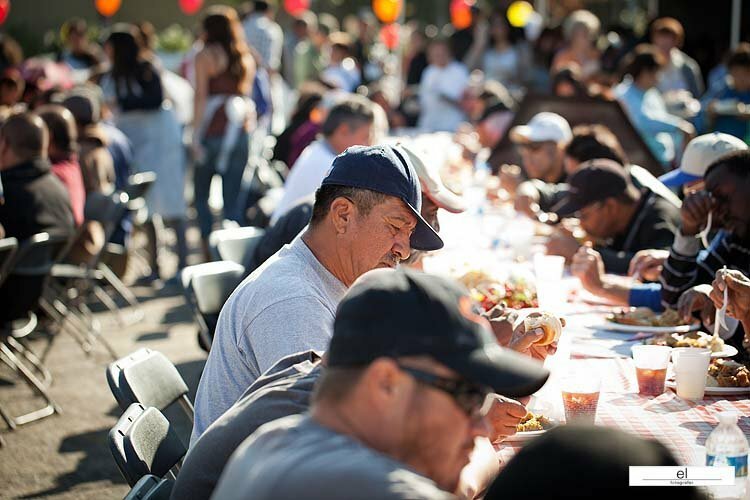 USHS, the San Gabriel Valley’s largest social services agency, offers year-round community meal programs and other services for the area’s homeless population, including emergency shelter, community shower programs, children’s education and recreational activity and adult classes in parenting, money management and nutrition. 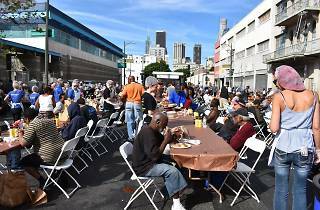 USHS has also hosted Dinner in the Park for over four decades; deemed the biggest potluck in the nation by the L.A. Times, the volunteer-run dinner helps provide warm holiday meals to more than 7,000 low income, homeless and senior citizens. 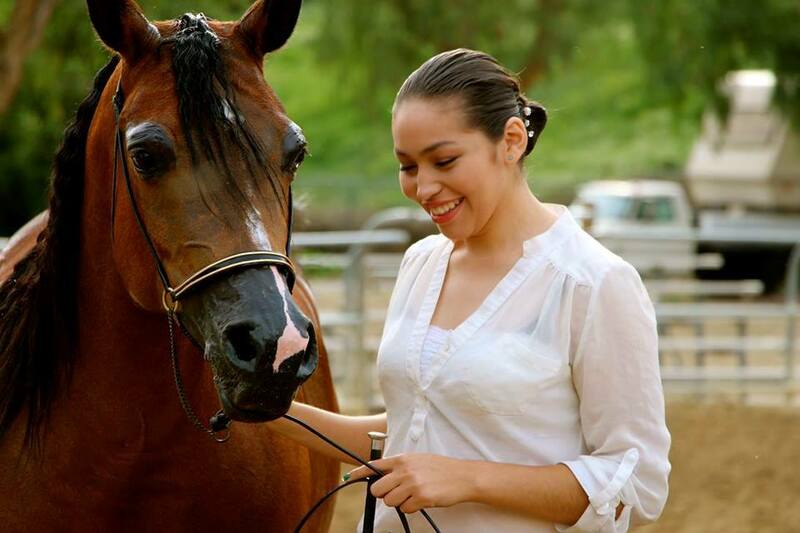 Santa Monica–based One Voice has services that run the gamut, from emergency relief to families in crisis to a scholars program for low income students. The organization puts on an annual Holiday Food Program to distribute Christmas food baskets, toys and books to more than 2,500 families living in poverty in the L.A. area. 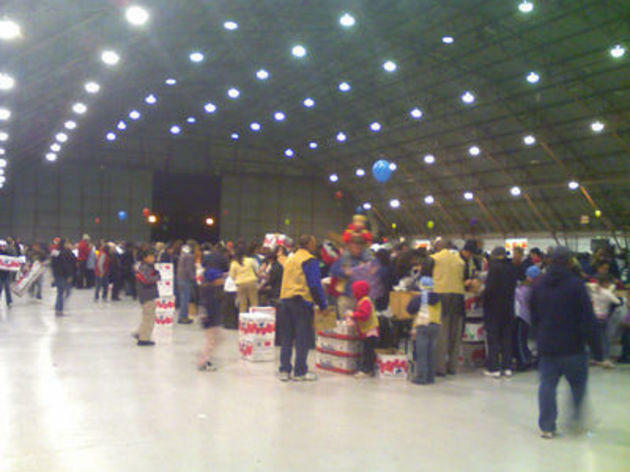 On the Thursday and Friday before Christmas, more than 2,000 volunteers come together to prep, sort and package food—it’s a festive atmosphere with holiday music and lots of socializing. 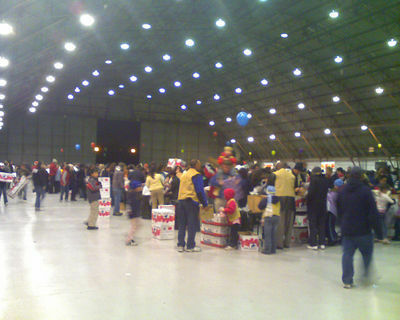 Saturday, volunteers deliver the food and toys to seven distribution centers, and on Sunday, families arrive to receive the goods and celebrate with volunteers. To be part of the celebration, check One Voice’s volunteer info page and registration form. No matter your age, APLA Health has a volunteer opportunity for you. Sure, you could just donate funds, but the AIDS organization relies on its volunteers, who contribute more than 65,000 hours of service each year. 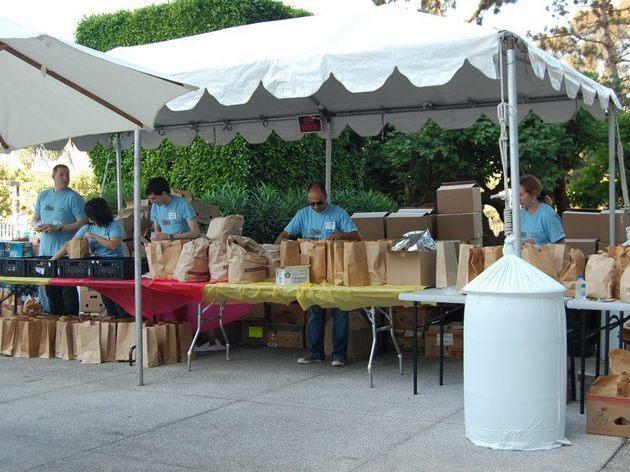 If you’re interested, you can choose between four types of volunteers: client access volunteer, food pantry volunteer, nutrition/administrative volunteer and a special events volunteer, like AIDS Walk Los Angeles. If you’re interested in learning more, email volunteer@apla.org, or apply online. 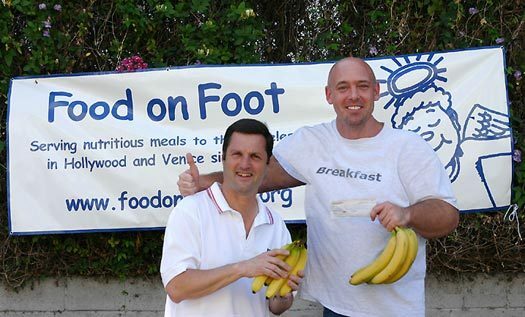 At each of SOVA’s three service centers (West L.A., West Hollywood and Van Nuys), food pantries are stocked with nutritious canned and packaged foods, breads and fresh produce—the pantries provide a free five-day supply of groceries and hygiene products for each family member in need. 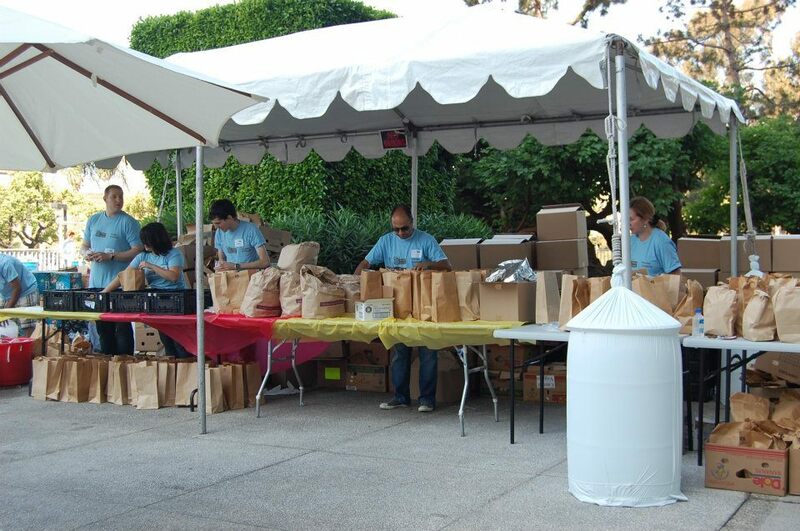 Volunteers are needed for everything from packaging and inventory to registering clients and entering data. SOVA offers opportunities for both “occasional” and “core” volunteers—check their site to learn more about both. 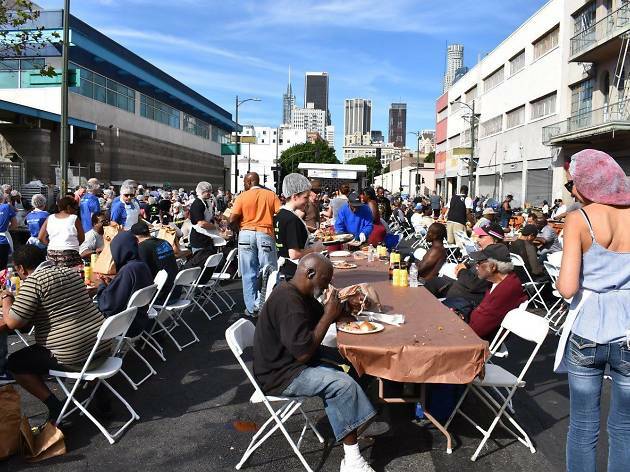 The Fred Jordan Mission has provided food, clothing, blankets and other services to the homeless population of inner city Los Angeles for more than 50 years. 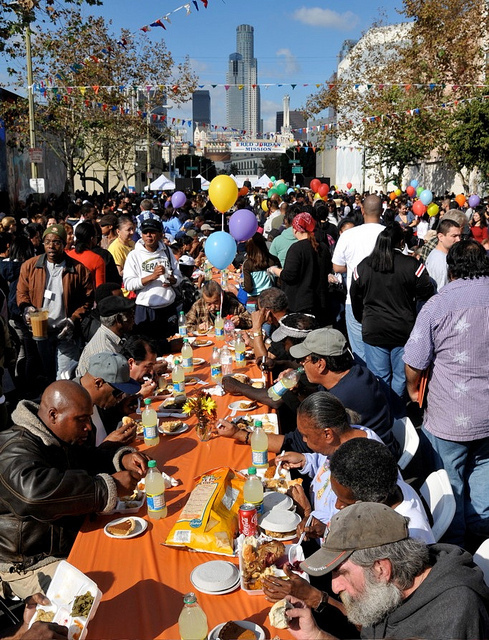 Its Street Banquet on Skid Row offers a traditional turkey dinner to hundreds of the area’s homeless for Thanksgiving. FJM also hosts a Christmas Celebration, during which volunteers hand out food bags, toys and blankets—as well as sing carols—to more than 12,000 of downtown’s neediest. Volunteer opportunities are also available during Easter, Mother’s Day and back-to-school time. Check the Mission’s website to get involved. Note: The FJM is a religious organization and tends to hand out “food for the soul” (a.k.a. bibles) along with its “food for the body”—in case that sort of thing makes you uncomfy. This organization distributes food (chicken, fresh fruits and veggies, granola bars, milk etc.) and gently used clothing, shoes and blankets every week in Hollywood. You can sign up to volunteer anytime, and it usually costs $25 (providing the funds to feed about five people for a day). Note: Neil Patrick Harris is a benefactor—he won $100,000 for FOF on Jeopardy in 2010—so don’t be surprised if while volunteering you see him don a hairnet and take to the streets. 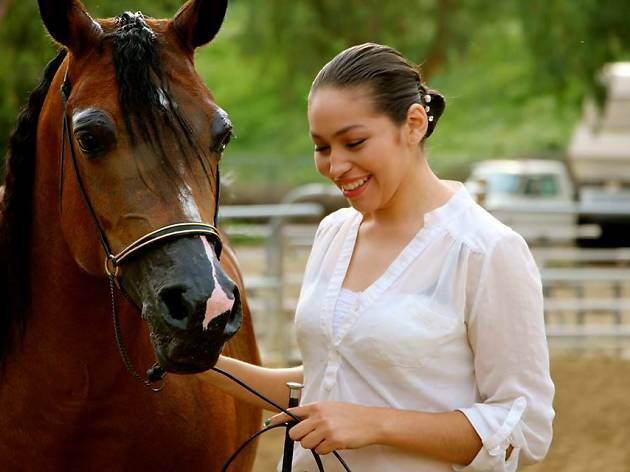 Dream Catcher of Los Angeles is one of many local organizations that focus on horse therapy. 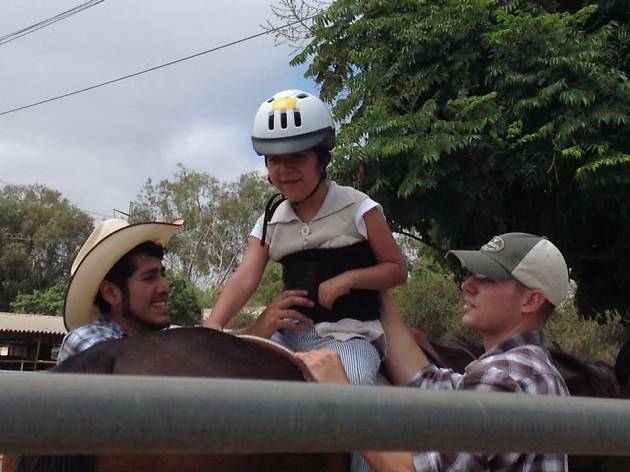 The riding center works with children, adults and veterans with cognitive, physical and emotional disabilities, using equine therapy to improve the mind, body and spirit. Volunteers are needed in a variety of capacities, from providing horse lessons, caring for the horses, fundraising and organizational tasks. If you’re interested, there is a volunteer form available online. 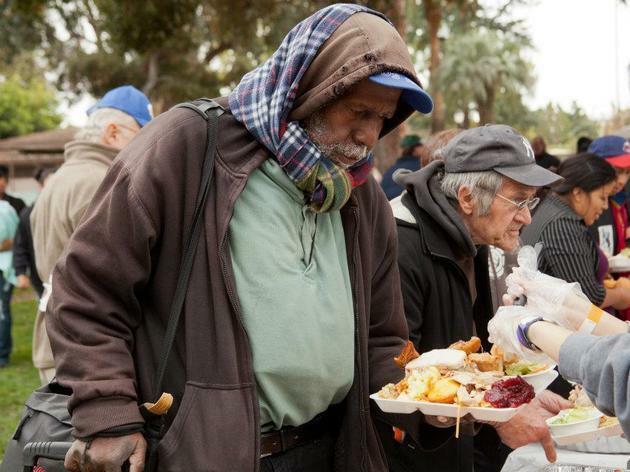 Hope of the Valley Rescue Mission offers a host of services, including hot meals, health services and housing to the needy population in San Fernando Valley. You can help to hand out meals, clothing, medicine and hygiene kits on weekdays, as well as volunteering for weekend meals on Saturdays. Check the website for a volunteer application form and a calendar of events. 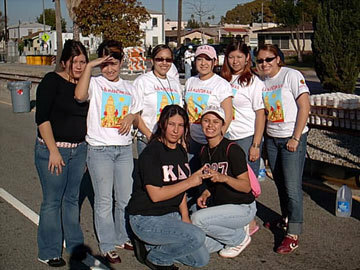 This organization comes together to prepare meals which volunteers then bring to different shelters in West L.A. to be handed out by shelter volunteers. If you’re interested in the prep and cooking, but maybe not ready for the interaction side of things, this could be the group for you. 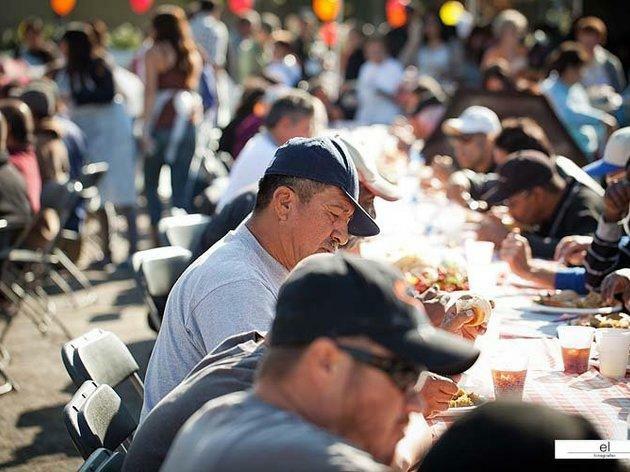 Each November, OIF hosts its annual Homeless Feeding, an all-day event including meal prep, assembly and packing, delivery and serving at different shelters (this part is optional) and post-event cleanup. You can either donate your time or drop off key necessities like pre-cooked turkeys, pies, juice boxes, water or delivery vans—you know, if you have one handy. 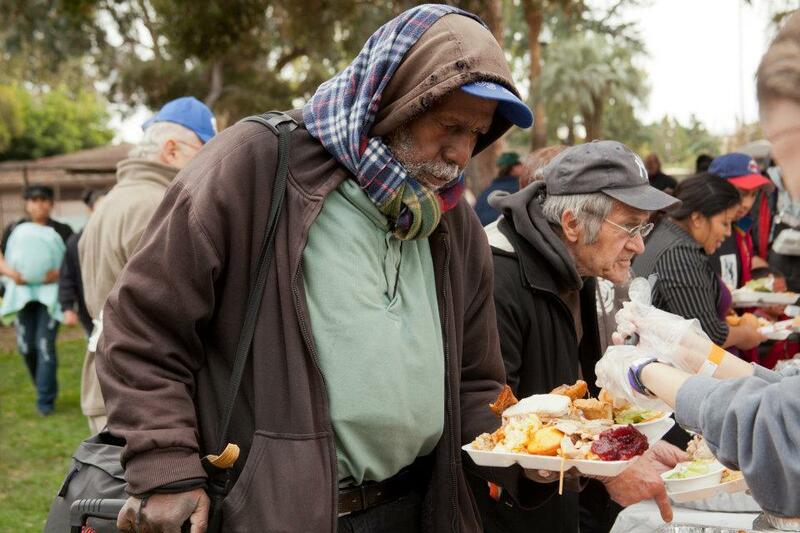 Help distribute food to L.A.’s hungry at the L.A. Regional Food Bank. Volunteers are needed for food sorting, special events and food drives, including the organization’s yearly Operation Gobble, where volunteers will help to sort, inspect and repackage food for delivery during the holidays. Check the Food Bank website for a list of upcoming volunteer and Gobble dates and to register. Look for more ways to give back? If you want to spread the wealth, here are 10 fantastic local organizations that your radar may have missed.